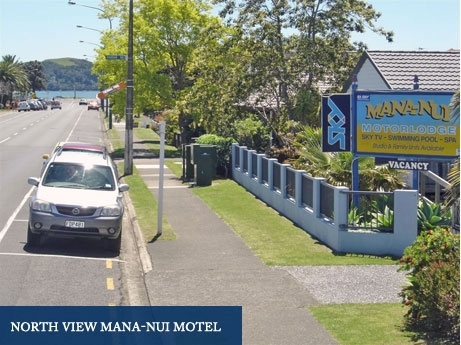 MANA-NUI Motel accommodation lies on a prime site in the heart of Whitianga township's main street - Albert St. Our motel is positioned at the northern end, on the eastern side of the shopping precinct, just 300m from the beautiful white sands of Buffalo Beach. 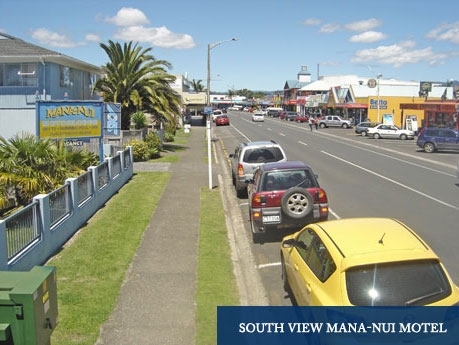 Mana-Nui Motel is close to cafes, bars, restaurants and shops that will help to make your stay that more enjoyable. Whitianga is set on the western banks of the entrance to Whitianga Harbour, in Mercury Bay on the Coromandel Peninsula. Whitianga - with its deep water harbour, white sandy beaches, many safe bays, and surrounding forest covered hills combine to make this area one of the classic holiday destinations for New Zealanders and tourists alike. This is an awesome destination for anyone who wants to sample the delights of one New Zealand’s most beautiful regions. Standing at our main gate you can look north up to the end of Albert St to Buffalo Beach and see the sea stretching out across Mercury Bay and into the distance. By turning to the west and to the south, you will see a sample of Whitianga's shops and be able to appreciate how close you are to all the local amenities. Some of the best beaches in New Zealand – Kuoatunu Beach, Hot Water Beach, Hahei, Cathedral Cove, Flaxmill Bay, Front Beach, New Chums Beach, Cooks Beach, Whangapoua, Opito Bay, and Otama Beach – are all within an easy drive of Mana-Nui Motel. For any further information about our location on the Coromandel Peninsula and your accommodation needs, please do not hesitate to email or phone Joanne and Mervyn at the Mana-Nui Motel Whitianga, who will be only to happy to help. A 2.5hr to 3hr drive by the most direct route. Leave Auckland International Airport and make your way to the southern motorway, State Highway 1 (SH1), driving south towards Hamilton. Up and over the Bombay Hills, at the bottom turn left onto SH 2 towards Thames/Paeroa/Tauranga. Carry along SH2 past Mangatawhiri and Maramarua, eventually turning left onto SH25 to Thames. After a good half hour or more you will cross over a 500m-long two-lane bridge, past Kopu on your left, you will then come to a large roundabout. You will find this part of the journey a pleasant drive along relatively straight and flat, wide tar-sealed roads. Option 1: The first and fastest (approx max 1.5 hrs, 85km) is to turn right at the Kopu roundabout, drive for a few hundred metres, then turn left onto SH25A towards Whitianga/Tairua via the Kopu Hikuai Rd. Once on the other side, SH 25A converts to SH25 at the intersection to Whangamata. Do not turn right but carry on SH25 moving north towards Tairua. Whitianga is another 40 minutes north of Tairua. Option 2: The second choice (2-2.5 hrs) is to turn left at the Kopu roundabout and drive on through Thames on SH25, following the coast road towards Coromandel Town. Just south (and before entering Coromandel Town) turn right staying on SH25. Follow this road as it passes through Te Rerenga, Kuaotunu, and on to Whitianga. NB: There are 2 further subsidiary routes to Whitianga, which divert off SH25 on the Thames to Coromandel Town coast road. Care is required when taking either of these roads, as the Tapu Coroglen Rd and the 309 Rd are both gravel roads. Approximately 2.5 to 3 hours non-stop driving. Follow SH 2 north from Tauranga, travelling through Bethlehem, Katikati, onto Waihi. This road is relatively strait and flat all being tarsealed. At Waihi, turn right onto SH 25. Follow this road through to Whangamata and eventually Whitianga. It is tarsealed, hilly, windy, slower and more narrow in places. Carry on through Whangamata moving north on SH 25 to a major T intersection, left is Thames, SH 25A, and right is Tairua/Whitianga, SH 25. Take the Tairua/Whitianga road.